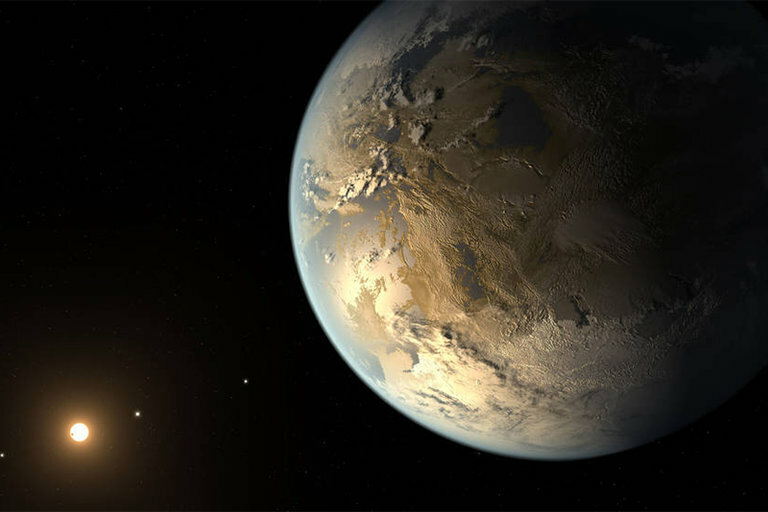 Boston University astronomers suggest searching for charged oxygen in the ionospheres of exoplanets as an alternative method for finding extraterrestrial life. Humanity has long wondered if we are alone in the universe. And now that we know of 3,728 confirmed exoplanets in our galaxy, we seem to be closer than ever to finding an answer. But how do astronomers peer at distant worlds — which can be many, many light-years away — and look for signs of life? Researchers have been able to detect the composition of atmospheres on several of these planets orbiting other stars. But what do they look for exactly, and what factors would indicate potential life? A group of astronomers from Boston University took a cue from what is unique about our own life-filled planet and propose that looking for oxygen atoms in an exoplanet’s ionosphere would be the best indicator of life. “[Earth has] atomic oxygen ions, O+, in the ionosphere as a direct consequence of having life on the planet,” Boston University professor of astronomy Michael Mendillo said in a statement. He is the lead author of a new study on the topic published in the journal Nature. “So why don’t we see if we can come up with a criterion where the ionosphere could be a biomarker, not just of possible life but of actual life." Mendillo and his colleagues didn’t start out looking for life on worlds orbiting distant stars. They were doing a comparative study of all the planetary ionospheres in our own solar system, and were working with NASA’s MAVEN mission at Mars, trying to understand how the molecules that made up the Red Planet’s ionosphere had escaped. Ever since astronomers have been studying planetary atmospheres, they’ve known that the thin upper atmospheric layer called the ionosphere varies greatly within our solar system. All the planets have them except Mercury, which orbits so close to the sun that its atmosphere is stripped off. Earth is unique in our solar system because oxygen fills the ionosphere, while other planets have carbon dioxide or hydrogen, primarily. And Earth’s upper atmosphere has a specific type of oxygen — single atoms with a positive charge. This high concentration of atomic oxygen is due to life on Earth, specifically generated by the process of photosynthesis in which plants, trees, and shrubs use sunlight to synthesize foods from carbon dioxide and water. The team proposes that the dominance of O+ ions in the ionosphere can be used to identify a planet in orbit around a star where global-scale biological activity is present. While previous studies have looked for evidence of water in exoplanet atmospheres, the team says finding a peak concentration of oxygen ions (O+) in the ionosphere would be a better indicator. Other planets in our solar system do have some oxygen in their lower atmospheres, but Earth has much more, about 21 percent. This is because photosynthesis has been going on for the past 3.8 billion years. “Destroy all the plants on Earth and our atmosphere’s oxygen will vanish away in mere thousands of years,” said Paul Withers, also from BU. Withers noted that the abundance of O2 near the Earth’s surface leads to an abundance of O+ high in the sky. The oxygen exhaled by plants doesn’t just stay near Earth’s surface, but floats upward. When the O2 gets about 150 kilometers above Earth’s surface, ultraviolet light splits it in two, and the single oxygen atoms then float higher, into the ionosphere, where more ultraviolet light and X-rays from the sun rip electrons from their outer shells, leaving charged oxygen zipping through the air. This finding, the team says, suggests that scientists seeking extraterrestrial life could perhaps narrow their search area. Astronomers studying exoplanets have come up with several unique and creative ways of looking for life on other worlds. One group of researchers suggested a technique that Earth-orbiting satellites already use in order to determine land cover that looks for variations in how light is reflected off vegetation, or how trees would cast shadows on the planet. But current telescopes looking at exoplanets do not have this capability. Others have proposed searching for “glints” of light off oceans or lakes. But as we’ve seen from Saturn’s moon Titan, glints off planetary bodies do not necessarily come from water-filled lakes. With current technology, astronomers can look for potential life on exoplanets through signs of water molecules in the atmospheres. The chemical composition of exoplanetary atmospheres can provide detail about the physical — and potentially life bearing —conditions on these worlds. The most successful method for doing such a study is the transit spectroscopy method. When an exoplanet passes in front of its host star from our point of view, a small fraction of the stellar light passes through the exoplanetary atmosphere. By measuring the fraction of stellar light able to penetrate the atmosphere at different wavelengths, the chemical composition of the atmosphere can be inferred. The fraction of stellar light that passes through a transiting exoplanet's atmosphere, however, is very small, which constrains both the telescopes and instruments that can be used and the planetary system that can be observed. Looking specifically at an exoplanet’s ionosphere is even more difficult and Mendillo and his team know that the technology to detect the tiny ionosphere on any exoplanet isn’t currently available. But they think space telescopes like the James Webb Space Telescope — set to launch next year — or other proposed telescopes might make such a detection possible. They also suggest narrowing the search to Earth-sized worlds that orbit sun-like stars in the habitable zone, where water might exist. This narrows the field considerably since these types of stars, know as G-type stars, make up only about 20 percent of stars. But still, given what we know from the statistical analysis from the Kepler mission, that amounts to several tens of billions of potentially habitable, Earth-size planets in the Milky Way Galaxy.